Winter is harsh in Jerusalem with driving rain and biting wind. This, coupled with the fact that the houses here would not be renowned for their insulation, makes for an uncomfortable January and February. It says a lot when you need to put a heater into the en suite each morning before you have a shower! Thankfully the weather is improving and our thoughts now turn to air conditioning!!! Jerusalem has understandably, a wealth of important and interesting places but to me, three stand out, and these are some of the holiest sites in Judaism, Christianity and Islam, namely the Western Wall, The Church of the Holy Sepulcher and the Temple Mount/Haram Al Sharif. In approximately 33 AD, Jesus of Nazareth was condemned to death, crucified on Mount Golgotha and buried in a tomb that had been excavated in a nearby garden. After three days he rose from the dead. 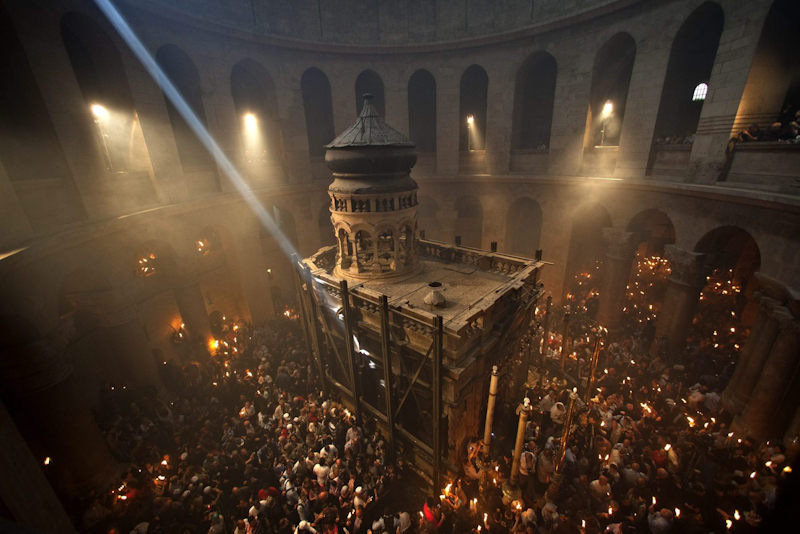 From this moment the Tomb of the Resurrection became the central place of faith for all Christianity. Undiscovered for years, it was the first Christian emperor, Constantine the Great, who ordered in 325 AD that an earlier temple to Aphrodite (the Greek Goddess of love, beauty and pleasure) be replaced by a church. During the building of the Church, Constantine's mother, Helena, is believed to have rediscovered the "True Cross", and tradition holds that when she found three crosses, she tested each by having it held over a corpse and when the corpse rose up under one, that was the true cross. Constantine's church was built as two connected churches over two different holy sites. The church was started in 325 AD, consecrated in 335 AD and contains, according to traditions dating back at least to the fourth century, the two holiest sites in Christendom: the site where Jesus of Nazareth was crucified, known as "Calvary" in Latin and "Golgotha" in Greek, and Jesus's empty tomb, where he is said to have been buried and resurrected. Within the church proper are the last four (or, by some definitions, five) Stations of the Via Dolorosa, (the Way of the Cross) representing the final episodes of Jesus' Passion. Control of the church itself is shared between several Christian denominations and secular entities in complicated arrangements essentially unchanged for over 160 years, and some for much longer. The main denominations sharing property over parts of the church are the Greek Orthodox, Armenian Orthodox and Roman Catholic, and to a lesser degree the Egyptian Copts, Syriacs and Ethiopians. Meanwhile, Protestants including Anglicans have no permanent presence in the Church, generally regard the Garden Tomb, elsewhere in Jerusalem, as either the true place of Jesus' crucifixion and resurrection, or at least a more evocative site to commemorate those events. Returning to the control of the church, it has been fractious and even murderous for well over a hundred years. The Ottoman Sultan's firman (decree) of 1853, known as the "status quo", pinned down the now permanent statutes of property and the regulations concerning the roles of the different denominations and other custodians. Under the status quo, no part of what is designated as common territory may be so much as rearranged without consent from all communities. When something is moved without agreement it has often violent consequences and the Israeli police are regularly called in to separate fighting Christian clerics. Indeed the key to the front door of the church has been held by the local Muslim Nusaybah family since been given to them by Sultan Saladin in 1187. Each morning and evening, in a ritual unchanged for years, the front door is ceremoniously unlocked in the morning and locked in the evening by the Nusaybah family, which are one of the of the oldest Arab families in Jerusalem. Another notable feature of the church is the "immovable ladder," (a ladder made of cedar wood, possibly from Lebanon) that has literally remained unmoved since being set in place by a worker in 1757, or possibly earlier. Due to the previously mentioned ‘status quo' nothing can be done in the church except by consensus, and that includes, amazingly enough, the movement of the ladder. Since 1757, the clerics haven't agreed to move the ladder. The ladder long ago also gained significance as a symbol of the division between the Orthodox and Catholic Churches. As a consequence, a papal request from the late Pope Paul VI in 1964 asked that the ladder not be moved until the Roman Catholic and Orthodox Churches reach a state of authentic ecumenism, moving toward communion. 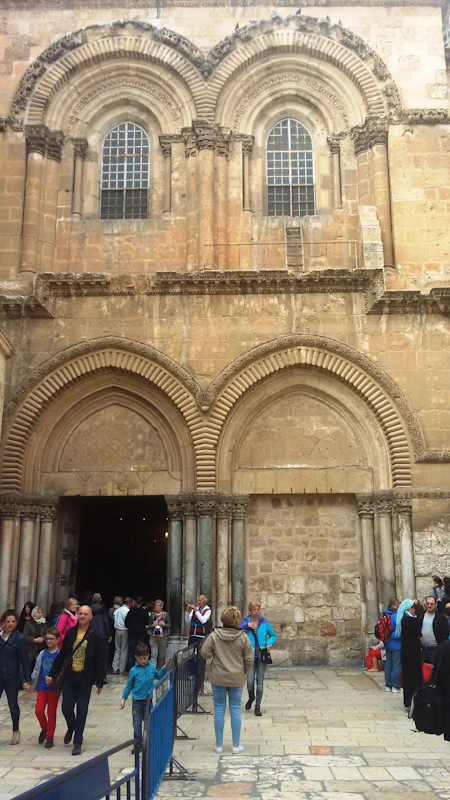 Church of the Holy Sepulchre and the 'immovable' ladder. The ‘status quo' often leads to the neglect of badly needed repairs when the communities cannot come to an agreement among themselves about the final shape of a project. Just such a disagreement has delayed the renovation of the Aedicule, (the shrine built over the tomb of Jesus) which is today held together by steel girders put in place in 1947 following damage from an earlier earthquake in 1927. Presently negotiations between the denominations seem to have borne fruit and a conservation plan has recently been announced that would see the reinstatement of this hugely important shrine to its former glory. Of course after visiting the holiest site in Christianity one should also try and visit the site of the holy sites of the other two Abrahamic faiths, namely the Temple Mount/Haram Al Sharif and the Wailing Wall. The Temple Mount/Haram Al Sharif is known as the Temple Mount by Jewish people as it was there that the Second Temple stood and it is known as Haram Al Sharif (the Noble Sanctuary) by Muslims, hence it's official title the Temple Mount/Haram Al Sharif. To understand the complexity of this spot, sacred to Jews and Muslims alike, it should be remembered that both the Al Aksa Mosque and the Dome of the Rock (generally accepted as the 3rd and 5th holiest sites in Islam respectively) are built on the platform (Temple Mount) on which stood the Jewish Temple, the Holy of holies prior to its destruction in 70 AD. 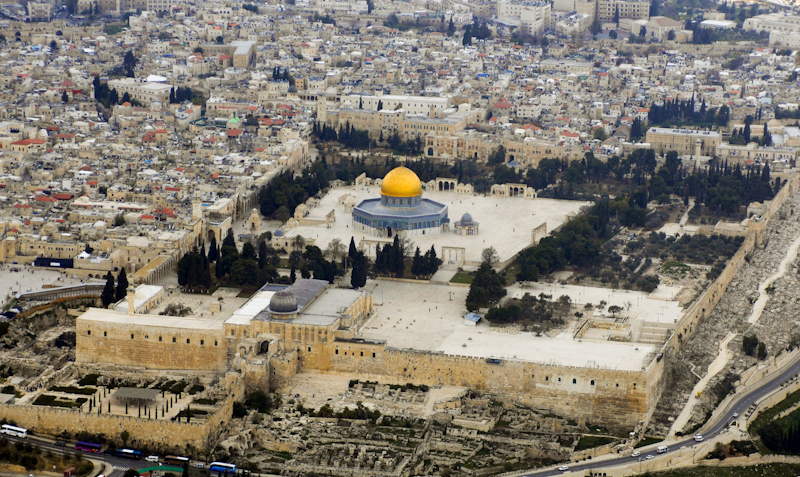 Aerial view of the Temple Mount/Haram al Sharif. 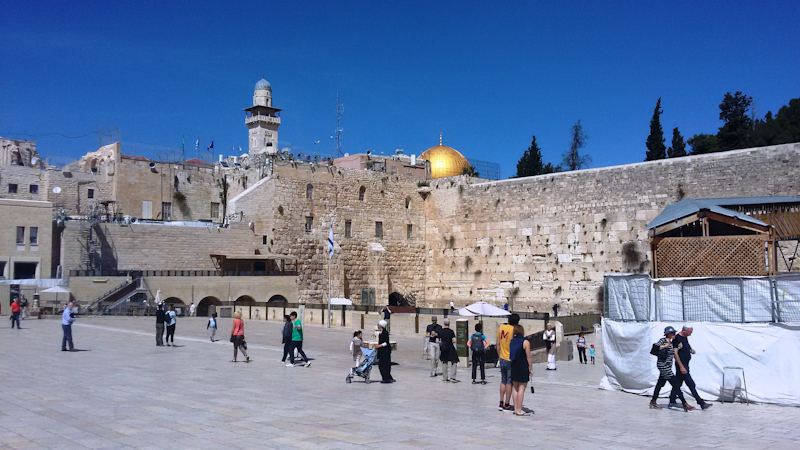 The area enclosed by the walls was the platform on which the Jewish second temple was built. It would have towered possibly three times higher than the Dome of the Rock which can be seen with a distinctive gold colour. The Al Aksa Mosque can be seen with a smaller grey dome and to the left of the Al Aksa Mosque is the Western Wall. To put the vast size of the Temple Mount/Haram Al Sharif into context, the Al Aksa Mosque can hold approximately 5000 people. Visiting the Western Wall, it is necessary to wear a skull cap (Yarmulka) as a mark of respect. The Western Wall (also known as the Wailing Wall or the Kotel in Hebrew) is one of four walls Herod the Great built to support the 1,555,000-square-foot plaza on which the Second Temple stood. The First Temple is believed to have been built by King Solomon in the same general area sometime between 900 BC and 800 BC. It was destroyed, according to the Hebrew Bible, by the Babylonian King Nebuchadnezzar II sometime between 500 BC and 400 BC. It would be some hundreds of years later, circa 19 BC, that King Herod would build the Second temple. So the Western Wall is considered holy due to its connection to the Temple Mount which is, as mentioned earlier the platform on which the Second Temple stood. It was Abraham who first linked the Jewish people to Jerusalem, when he offered Isaac (some Muslims believe it was his other son Ismael) in sacrifice on a rock on Mount Moriah on which now stands the Temple Mount complex. This rock is recognized by all three Abrahamic religions as the site of Abraham's attempted sacrifice of his son. This rock of offering, over which the Muslim Dome of the Rock was built in the late seventh century, is also known in Jewish tradition as the Foundation Stone of the world. Starting with the Dome of The Rock, this is a shrine located on the Temple Mount that was initially completed in 691 AD on the order of the Umayyad Caliph Abd al-Malik. The Dome of the Rock is now one of the oldest works of Islamic architecture and is a UNESCO World Heritage Site, (along with the Western Wall, and the "Resurrection Rotunda" in the previously mentioned Church of the Holy Sepulcher). Its architecture and mosaics were believed to be patterned after nearby Byzantine churches. Muslims believe the location of the Dome of the Rock to be the site mentioned in the Qur'an, which tells the story of the Isra and Mi'raj, the miraculous Night Journey of Prophet Muhammad from Mecca to "the farthest mosque", where he leads prayers and rises to heaven to receive instructions from Allah. Continuing on to the Al Aqsa Mosque, this was originally a small prayer house built by the Rashidun caliph Umar, in 690 AD but was rebuilt and expanded by the Umayyad caliph Abd al-Malik and finished by his son al-Walid in 705 AD. The mosque was completely destroyed by an earthquake in 746 and rebuilt by the Abbasid caliph al-Mansur in 754. His successor al-Mahdi rebuilt it again in 780. Another earthquake destroyed most of Al-Aqsa in 1033, but two years later the Fatimid caliph Ali az-Zahir built another mosque which has stood to the present day. The historical significance of the Al-Aqsa Mosque in Islam is further emphasized by the fact that Muslims turned towards Al-Aqsa when they prayed for a period of sixteen or seventeen months after their migration to Medina in what is now Saudi Arabia in 624 AD; it thus became the qibla ("direction") that Muslims faced for prayer. Muhammad later prayed towards the Kaaba (The Cube) which is Islam's holiest site and is located in Mecca, also in Saudi Arabia after receiving a revelation during a prayer session. The qibla was then relocated to the Kaaba, which is where Muslims have been directed to pray ever since. It is a unique opportunity to be able to visit these three holy sites, intensely sacred to Judaism, Christianity and Islam, and wonder at the zeal and drive that enabled people to raise such magnificent examples of early architecture to honour their God. Unfortunately distrust and division between these three great Abrahamic faiths has led to, and still contributes to, much of the violence in the world. 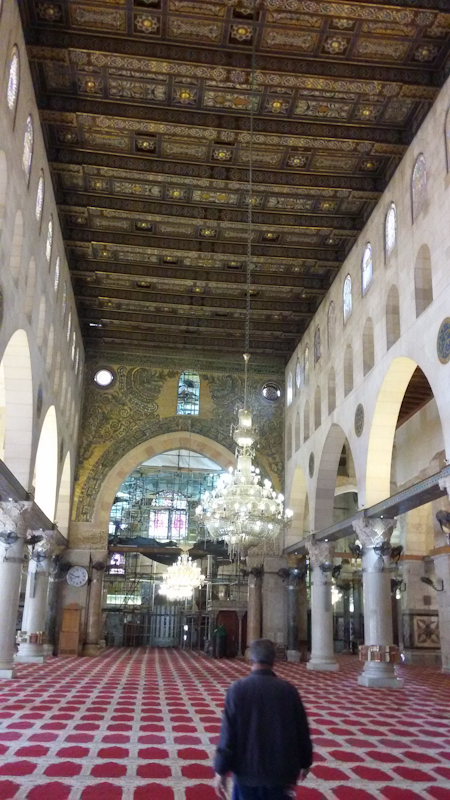 Interior of the Al Aqsa Mosque. 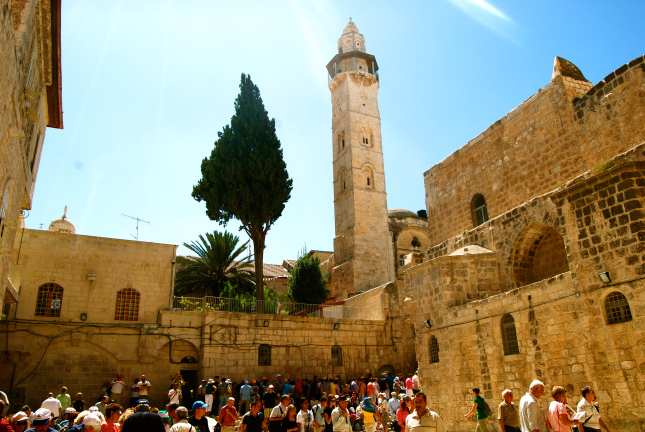 But it was not always so, in earlier times people of the three faiths managed to get along in Jerusalem and in an interesting twist, following the fall of Jerusalem after a siege in 637 AD, the Caliph Omar received the surrender of the Church of the Holy Sepulcher from the Patriarch Sephronius. Being interested in the architecture (it was possibly the largest building in Jerusalem at that time) he was been shown around the interior when he heard the Muslim call to prayer. Patriarch Sephronius invited the Caliph to pray in the church but he refused, stating that if he did, it would be immediately changed into a mosque by his followers. So he went outside towards the end of the courtyard to pray and a mosque was subsequently erected on the site and still stands there today, called the Mosque of Omar. So my time here is slowly drawing to a close, it's been nearly two years since I deployed to the region. I spent a very interesting 17 months living in Tyre in Lebanon before being deployed to Jerusalem in December of last year. In some ways the time has flown and others it dragged a bit, especially when my mother Bernie passed away last September, but I suppose time and faith are great healers so I will dedicate this post to Bernie Mc Donald, whose love of literature has permeated into my own interest in writing about the weird and wonderful places I have been privileged to visit and live.